For the New Zealand poet and translator, see Edward Jenner (writer). 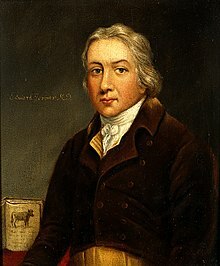 Edward Jenner, FRS FRCPE (17 May 1749 – 26 January 1823) was an English physician and scientist who was the pioneer of smallpox vaccine, the world's first vaccine. The terms "vaccine" and "vaccination" are derived from Variolae vaccinae (smallpox of the cow), the term devised by Jenner to denote cowpox. He used it in 1796 in the long title of his Inquiry into the Variolae vaccinae known as the Cow Pox, in which he described the protective effect of cowpox against smallpox. Jenner is often called "the father of immunology", and his work is said to have "saved more lives than the work of any other human". In Jenner's time, smallpox killed around 10 percent of the population, with the number as high as 20 percent in towns and cities where infection spread more easily. In 1821 he was appointed physician extraordinary to King George IV, and was also made mayor of Berkeley and justice of the peace. A member of the Royal Society, in the field of zoology he was the first person to describe the brood parasitism of the cuckoo. In 2002, Jenner was named in the BBC's list of the 100 Greatest Britons. Edward Jenner was born on 17 May 1749 (6 May Old Style) in Berkeley, Gloucestershire, as the eighth of nine children. His father, the Reverend Stephen Jenner, was the vicar of Berkeley, so Jenner received a strong basic education. He went to school in Wotton-under-Edge and Cirencester. During this time, he was inoculated for smallpox, which had a lifelong effect upon his general health. (Crucially this meant that he underwent variolation and not vaccination.) At the age of 14, he was apprenticed for seven years to Daniel Ludlow, a surgeon of Chipping Sodbury, South Gloucestershire, where he gained most of the experience needed to become a surgeon himself. In 1770, Jenner became apprenticed in surgery and anatomy under surgeon John Hunter and others at St George's Hospital. William Osler records that Hunter gave Jenner William Harvey's advice, well known in medical circles (and characteristic of the Age of Enlightenment), "Don't think; try." Hunter remained in correspondence with Jenner over natural history and proposed him for the Royal Society. Returning to his native countryside by 1773, Jenner became a successful family doctor and surgeon, practising on dedicated premises at Berkeley. Jenner and others formed the Fleece Medical Society or Gloucestershire Medical Society, so called because it met in the parlour of the Fleece Inn, Rodborough (in Gloucestershire). Members dined together and read papers on medical subjects. Jenner contributed papers on angina pectoris, ophthalmia, and cardiac valvular disease and commented on cowpox. He also belonged to a similar society which met in Alveston, near Bristol. He became a master mason on 30 December 1802, in Lodge of Faith and Friendship #449. From 1812–1813, he served as worshipful master of Royal Berkeley Lodge of Faith and Friendship. Edward Jenner was elected fellow of the Royal Society in 1788, following his publication of a careful study of the previously misunderstood life of the nested cuckoo, a study that combined observation, experiment, and dissection. He described how the newly-hatched cuckoo pushed its host's eggs and fledgling chicks out of the nest (contrary to existing belief that the adult cuckoo did it). Having observed this behaviour, Jenner demonstrated an anatomical adaptation for it—the baby cuckoo has a depression in its back, not present after 12 days of life, that enables it to cup eggs and other chicks. The adult does not remain long enough in the area to perform this task. Jenner's findings were published in Philosophical Transactions of the Royal Society in 1788. "The singularity of its shape is well adapted to these purposes; for, different from other newly hatched birds, its back from the scapula downwards is very broad, with a considerable depression in the middle. This depression seems formed by nature for the design of giving a more secure lodgement to the egg of the Hedge-sparrow, or its young one, when the young Cuckoo is employed in removing either of them from the nest. When it is about twelve days old, this cavity is quite filled up, and then the back assumes the shape of nestling birds in general." Jenner's nephew assisted in the study. He was born on 30 June 1737. Jenner's understanding of the cuckoo's behaviour was not entirely believed until the artist Jemima Blackburn, a keen observer of bird life, saw a blind nestling pushing out a host's egg. Her description and illustration of this were enough to convince Charles Darwin to revise a later edition of On the Origin of Species. Jenner's interest in Zoology played a large role in his first experiment with inoculation. Not only did he have a profound understanding of human anatomy due to his medical training, but he also understood animal biology and its role in human-animal trans-species boundaries in disease transmission. At the time there was no way of knowing how important this connection would be to the history and discovery of vaccinations. We see this connection now; many present day vaccinations include animal parts from cows, rabbits, and chicken eggs, which can be attributed to the work of Jenner and his cowpox/smallpox vaccination. A lecturer's certificate of attendance given to Jenner. He attended many lectures on chemistry, medicine and physics. Jenner married Catherine Kingscote (died 1815 from tuberculosis) in March 1788. He might have met her while he and other fellows were experimenting with balloons. Jenner's trial balloon descended into Kingscote Park, Gloucestershire, owned by Anthony Kingscote, one of whose daughters was Catherine. He earned his MD from the University of St Andrews in 1792. He is credited with advancing the understanding of angina pectoris. In his correspondence with Heberden, he wrote, "How much the heart must suffer from the coronary arteries not being able to perform their functions." Jenner's discovery of the link between cowpox pus and smallpox in humans helped him to create the smallpox vaccine. Inoculation was already a standard practice but involved serious risks, one of which was the fear that those inoculated would then transfer the disease to those around them due to their becoming carriers of the disease. In 1721, Lady Mary Wortley Montagu had imported variolation to Britain after having observed it in Constantinople. Voltaire wrote that at this time 60% of the population caught smallpox and 20% of the population died of it. Voltaire also states that the Circassians used the inoculation from times immemorial, and the custom may have been borrowed by the Turks from the Circassians. The steps taken by Edward Jenner to create vaccination, the first vaccine for smallpox. Jenner did this by inoculating James Phipps with cowpox, a virus similar to smallpox, to create immunity, unlike variolation, which used smallpox to create an immunity to itself. By 1768, English physician John Fewster had realised that prior infection with cowpox rendered a person immune to smallpox. In the years following 1770, at least five investigators in England and Germany (Sevel, Jensen, Jesty 1774, Rendell, Plett 1791) successfully tested in humans a cowpox vaccine against smallpox. For example, Dorset farmer Benjamin Jesty successfully vaccinated and presumably induced immunity with cowpox in his wife and two children during a smallpox epidemic in 1774, but it was not until Jenner's work that the procedure became widely understood. Jenner may have been aware of Jesty's procedures and success. A similar observation had also been made in France by Jacques Antoine Rabaut-Pommier in 1780. Noting the common observation that milkmaids were generally immune to smallpox, Jenner postulated that the pus in the blisters that milkmaids received from cowpox (a disease similar to smallpox, but much less virulent) protected them from smallpox. On 14 May 1796, Jenner tested his hypothesis by inoculating James Phipps, an eight-year-old boy who was the son of Jenner's gardener. He scraped pus from cowpox blisters on the hands of Sarah Nelmes, a milkmaid who had caught cowpox from a cow called Blossom, whose hide now hangs on the wall of the St George's medical school library (now in Tooting). Phipps was the 17th case described in Jenner's first paper on vaccination. Jenner inoculated Phipps in both arms that day, subsequently producing in Phipps a fever and some uneasiness, but no full-blown infection. Later, he injected Phipps with variolous material, the routine method of immunization at that time. No disease followed. The boy was later challenged with variolous material and again showed no sign of infection. Donald Hopkins has written, "Jenner's unique contribution was not that he inoculated a few persons with cowpox, but that he then proved [by subsequent challenges] that they were immune to smallpox. Moreover, he demonstrated that the protective cowpox pus could be effectively inoculated from person to person, not just directly from cattle." Jenner successfully tested his hypothesis on 23 additional subjects. 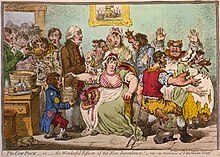 James Gillray's 1802 caricature of Jenner vaccinating patients who feared it would make them sprout cowlike appendages. Jenner continued his research and reported it to the Royal Society, which did not publish the initial paper. After revisions and further investigations, he published his findings on the 23 cases, including his 11 months old son Robert. Some of his conclusions were correct, some erroneous; modern microbiological and microscopic methods would make his studies easier to reproduce. The medical establishment deliberated at length over his findings before accepting them. Eventually, vaccination was accepted, and in 1840, the British government banned variolation – the use of smallpox to induce immunity – and provided vaccination using cowpox free of charge. (See Vaccination acts). The success of his discovery soon spread around Europe and was used en masse in the Spanish Balmis Expedition (1803–1806), a three-year-long mission to the Americas, the Philippines, Macao, China, led by Dr. Francisco Javier de Balmis with the aim of giving thousands the smallpox vaccine. The expedition was successful, and Jenner wrote, "I don’t imagine the annals of history furnish an example of philanthropy so noble, so extensive as this." Napoleon, who at the time was at war with Britain, had all his French troops vaccinated, awarded Jenner a medal, and at the request of Jenner he released two English prisoners of war and permitted their return home. Napoleon remarked he could not "refuse anything to one of the greatest benefactors of mankind." Jenner's continuing work on vaccination prevented him from continuing his ordinary medical practice. He was supported by his colleagues and the King in petitioning Parliament, and was granted £10,000 in 1802 for his work on vaccination. In 1807, he was granted another £20,000 after the Royal College of Physicians confirmed the widespread efficacy of vaccination. Jenner was also elected a foreign honorary member of the American Academy of Arts and Sciences in 1802, and a foreign member of the Royal Swedish Academy of Sciences in 1806. In 1803 in London, he became president of the Jennerian Society, concerned with promoting vaccination to eradicate smallpox. The Jennerian ceased operations in 1809. Jenner became a member of the Medical and Chirurgical Society on its founding in 1805 (now the Royal Society of Medicine) and presented several papers there. In 1808, with government aid, the National Vaccine Establishment was founded, but Jenner felt dishonoured by the men selected to run it and resigned his directorship. Returning to London in 1811, Jenner observed a significant number of cases of smallpox after vaccination. He found that in these cases the severity of the illness was notably diminished by previous vaccination. In 1821, he was appointed physician extraordinary to King George IV, and was also made mayor of Berkeley and justice of the peace. He continued to investigate natural history, and in 1823, the last year of his life, he presented his "Observations on the Migration of Birds" to the Royal Society. Jenner was found in a state of apoplexy on 25 January 1823, with his right side paralysed. He never fully recovered and eventually died of an apparent stroke, his second, on 26 January 1823, aged 73. He was buried in the Jenner family vault at the Church of St. Mary, Berkeley. He was survived by his son Robert Fitzharding (* 1797; † 1854) and his daughter Catherine (* 1794; † 1833), his elder son Edward (* 1789; † 1810) having died of tuberculosis aged 21. Neither fanatic nor lax, Jenner was a Christian who in his personal correspondence showed himself quite spiritual; he treasured the Bible. Some days before his death, he stated to a friend: "I am not surprised that men are not grateful to me; but I wonder that they are not grateful to God for the good which he has made me the instrument of conveying to my fellow creatures." However, his contemporary Rabbi Israel Lipschitz in his classic commentary on the Mishna Tiferet Yisrael wrote that Jenner was one of the "righteous of the nations," deserving a lofty place in the World to Come, for having saved millions of people from smallpox. In 1979, the World Health Organization declared smallpox an eradicated disease. This was the result of coordinated public health efforts, but vaccination was an essential component. Although the disease was declared eradicated, some pus samples still remain in laboratories in Centers for Disease Control and Prevention in Atlanta in the US, and in State Research Center of Virology and Biotechnology VECTOR in Koltsovo, Novosibirsk Oblast, Russia. Jenner's vaccine laid the foundation for contemporary discoveries in immunology. In 2002, Jenner was named in the BBC's list of the 100 Greatest Britons following a UK-wide vote. The lunar crater Jenner is named in his honour. Jenner was recognized in the TV show The Walking Dead. In "TS-19", a CDC scientist is named Edwin Jenner. Jenner's house in the village of Berkeley, Gloucestershire, is now a small museum, housing, among other things, the horns of the cow, Blossom. A statue of Jenner by Robert William Sievier was erected in the nave of Gloucester Cathedral. Another statue was erected in Trafalgar Square and later moved to Kensington Gardens. Near the Gloucestershire village of Uley, Downham Hill is locally known as "Smallpox Hill" for its possible role in Jenner's studies of the disease. London's St. George's Hospital Medical School has a Jenner Pavilion, where his bust may be found. Jennersville, Pennsylvania, is located in Chester County. The Edward Jenner Institute for Vaccine Research is an infectious disease vaccine research centre, part of the University of Oxford. A section at Gloucestershire Royal Hospital is known as the Edward Jenner Unit; it is where blood is drawn. A ward at Northwick Park Hospital is called Jenner Ward. Jenner Gardens at Cheltenham, Gloucestershire, opposite one of the scientist's former offices, is a small garden and cemetery. A statue of Jenner was erected at the Tokyo National Museum in 1896 to commemorate the centenary of Jenner's discovery of vaccination. A monument outside the walls of the upper town of Boulogne sur Mer, France. Edward Jenner's name is featured on the Frieze of the London School of Hygiene & Tropical Medicine. Twenty-three names of public health and tropical medicine pioneers were chosen to feature of the Keppel Street building when it was constructed in 1926. 1799 Further Observations on the Variolæ Vaccinæ, or Cow-Pox. ^ "Jenner, Edward (1749 – 1823) | Royal College of Physicians of Edinburgh". www.rcpe.ac.uk. Retrieved 26 June 2018. ^ Stefan Riedel, MD (January 2005). "Edward Jenner and the history of smallpox and vaccination". Proceedings (Baylor University. Medical Center). Baylor University Medical Center. 18 (1): 21–25. doi:10.1080/08998280.2005.11928028. PMC 1200696. PMID 16200144. ^ Baxby, Derrick. "Jenner, Edward (1749–1823)". Oxford Dictionary of National Biography. Oxford University Press. Retrieved 14 February 2014. ^ Baxby, Derrick (1999). "Edward Jenner's Inquiry; a bicentenary analysis". Vaccine. 17 (4): 301–7. doi:10.1016/s0264-410x(98)00207-2. PMID 9987167. ^ "Edward Jenner – (1749–1823)". Sundaytimes.lk. 1 June 2008. Retrieved 28 July 2009. ^ "History – Edward Jenner (1749–1823)". BBC. 1 November 2006. Retrieved 28 July 2009. ^ a b c d e "About Edward Jenner". The Jenner Institute. Retrieved 12 January 2013. ^ "Young Edward Jenner, Born in Berkeley". Edward Jenner Museum. Archived from the original on 14 September 2012. Retrieved 4 September 2012. ^ Loncarek K (April 2009). "Revolution or reformation". Croatian Medical Journal. 50 (2): 195–7. doi:10.3325/cmj.2009.50.195. PMC 2681061. PMID 19399955. ^ "Papers at the Royal College of Physicians summarised". ^ The Biographical Dictionary of Scottish Women. 2006. ^ Stern, Alexandra Minna; Markel, Howard (2005). "The History of Vaccines and Immunization: Familiar Patterns, New Challenges". Health Affairs. 24 (3): 611–621. doi:10.1377/hlthaff.24.3.611. PMID 15886151. ^ "Lady Montagu and the Introduction of Smallpox Inoculation to England | Muslim Heritage". www.muslimheritage.com. Retrieved 3 March 2017. ^ François Marie Arouet de Voltaire (1778). "Letters on the English or Lettres Philosophiques". ^ "Voltaire on Circassian Medicine: Inoculation". Circassian World. from Voltaire (1733). The Works of Voltaire. Vol. XIX (Philosophical Letters). 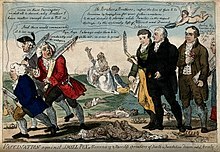 George Pearson, ed., An Inquiry Concerning the History of the Cowpox, Principally with a View to Supersede and Extinguish the Smallpox (London, England: J. Johnson, 1798), pp. 102–104. L. Thurston and G. Williams (2015) "An examination of John Fewster's role in the discovery of smallpox vaccination," Journal of the Royal College of Physicians of Edinburgh, 45 : 173–179. ^ Plett PC (2006). "Peter Plett and other discoverers of cowpox vaccination before Edward Jenner" [Peter Plett and other discoverers of cowpox vaccination before Edward Jenner]. Sudhoffs Archiv (in German). 90 (2): 219–32. PMID 17338405. ^ Hammarsten J. F.; et al. (1979). "Who discovered smallpox vaccination? Edward Jenner or Benjamin Jesty?". Transactions of the American Clinical and Climatological Association. 90: 44–55. PMC 2279376. PMID 390826. ^ Grant, John (2007). Corrupted Science: Fraud, Ideology and Politics in Science. London: Facts, Figures & Fun. p. 24. ISBN 978-1-904332-73-2. ^ Théodoridès J (1979). "Rabaut-Pommier, a neglected precursor of Jenner". Med Hist. 23: 479–80. doi:10.1017/s0025727300052121. PMC 1082587. PMID 390274. ^ "Edward Jenner & Smallpox". The Edward Jenner Museum. Archived from the original on 28 June 2009. Retrieved 13 July 2009. ^ Hopkins, Donald R. (2002). The greatest killer: smallpox in history, with a new introduction. Chicago: University of Chicago Press. p. 80. ISBN 978-0-226-35168-1. OCLC 49305765. ^ Williams, Gareth (2010). Angel of Death: The Story of Smallpox. Basingstoke: Palgrave Macmillan. p. 198. ISBN 9780230274716. ^ Carlos Franco-Paredes; Lorena Lammoglia; José Ignacio Santos-Preciado (2005). "The Spanish Royal Philanthropic Expedition to Bring Smallpox Vaccination to the New World and Asia in the 19th Century". Clinical Infectious Diseases. Oxford Journals. 41 (9): 1285–1289. doi:10.1086/496930. PMID 16206103. ^ a b De Beer, G. R. (May 1952). "The relations between fellows of the Royal Society and French men of science when France and Britain were at war". Notes and Records of the Royal Society of London. 9 (2): 297. doi:10.1098/rsnr.1952.0016. ^ Morgan, A.J. ; Poland, Gregory A. (30 December 2011). "The Jenner Society and the Edward Jenner Museum: Tributes to a physician-scientist" (PDF). Vaccine. 29 (Supplement 4): D152–D154. doi:10.1016/j.vaccine.2011.08.128. ^ Commons, Great Britain Parliament House of (18 July 2018). "Reports from Committees of the House of Commons which Have Been Printed by Order of the House: And are Not Inserted in the Journals [1715-1801" – via Google Books. ^ "Book of Members, 1780–2010: Chapter J" (PDF). American Academy of Arts and Sciences. Retrieved 28 July 2014. ^ John Baron, Life of Edward Jenner (London, 1837), vol. 2, pp. 122–5. ^ "Edward Jenner – St Mary's Church, Berkeley, Gloucestershire". Archived from the original on 20 September 2011. Retrieved 15 December 2010. ^ World Health Organization (2001). "Smallpox". ^ "Dr. Edward Jenner and the small pox vaccination". Essortment.com. Archived from the original on 14 April 2009. Retrieved 28 July 2009. ^ Royal College of Physicians. "JENNER, Edward (1749–1750)". AIM25 Archives. ^ Bala, Divya; Badrinath, Chan (2013). "Edward Jenner (1749 – 1823)". The National Medical Graduates Club. Retrieved 13 May 2018. ^ St George's, University of London. "Our History". ^ History of Bedford, Somerset, and Fulton Counties, Pennsylvania: With Illustrations and Biographical Sketches of Some of Its Pioneers and Prominent Men. Waterman, Watkins & Co. 1884. pp. 503–508. ^ "History and Demographics, Chester County, Pennsylvania". Penn Township. Retrieved 13 May 2018. ^ "Edward Jenner Unit". Gloucestershire Hospitals. NHS Foundation Trust. Retrieved 13 May 2018. ^ "Northwick Park and St Mark's Hospital ward phone numbers". London North West University Healthcare. Retrieved 12 May 2018. ^ "Monument à Edward Jenner – Boulogne-sur-Mer". e-monumen.net (in French). L’Association pour la sauvegarde et la promotion du patrimoine métallurgique haut-marnais. Retrieved 13 May 2018. ^ "Behind the Frieze". LSHTM. Archived from the original on 22 February 2017. Retrieved 21 February 2017. ^ Edward Jenner. "An Inquiry Into the Causes and Effects of the Variolæ Vaccinæ, Or Cow-Pox. 1798". The Harvard Classics, 1909–1914. ^ Edward Jenner. "Further Observations on the Variolæ Vaccinæ, or Cow-Pox. 1799". The Harvard Classics, 1909–1914. ^ Edward Jenner. "A Continuation of Facts and Observations Relative to the Variolæ Vaccinæ, or Cow-Pox. 1800". The Harvard Classics, 1909–1914. Cartwright K (October 2005). "From Jenner to modern smallpox vaccines". Occupational Medicine. 55 (7): 563–563. doi:10.1093/occmed/kqi163. PMID 16251374. Riedel S (January 2005). "Edward Jenner and the history of smallpox and vaccination". Proceedings. 18 (1): 21–5. doi:10.1080/08998280.2005.11928028. PMC 1200696. PMID 16200144. Tan SY (November 2004). "Edward Jenner (1749–1823): conqueror of smallpox" (PDF). Singapore Medical Journal. 45 (11): 507–8. PMID 15510320.
van Oss CJ (November 2000). "Inoculation against smallpox as the precursor to vaccination". Immunological Investigations. 29 (4): 443–6. PMID 11130785. Gross CP, Sepkowitz KA (1998). "The myth of the medical breakthrough: smallpox, vaccination, and Jenner reconsidered". International Journal of Infectious Diseases. 3 (1): 54–60. doi:10.1016/S1201-9712(98)90096-0. PMID 9831677. Willis NJ (August 1997). "Edward Jenner and the eradication of smallpox". Scottish Medical Journal. 42 (4): 118–21. PMID 9507590. Theves G (1997). "Smallpox: an historical review" [Smallpox: an historical review]. Bulletin De La Société Des Sciences Médicales Du Grand-Duché De Luxembourg (in German). 134 (1): 31–51. PMID 9303824. Kempa ME (December 1996). "Edward Jenner (1749–1823)--benefactor to mankind (100th anniversary of the first vaccination against smallpox)" [Edward Jenner (1749–1823)--benefactor to mankind (100th anniversary of the first vaccination against smallpox)]. Polski Merkuriusz Lekarski (in Polish). 1 (6): 433–4. PMID 9273243. Baxby D (November 1996). "The Jenner bicentenary: the introduction and early distribution of smallpox vaccine". FEMS Immunology and Medical Microbiology. 16 (1): 1–10. doi:10.1111/j.1574-695X.1996.tb00105.x. PMID 8954347. Larner AJ (September 1996). "Smallpox". The New England Journal of Medicine. 335 (12): 901, author reply 902. doi:10.1056/nejm199609193351217. PMID 8778627. Aly A, Aly S (September 1996). "Smallpox". The New England Journal of Medicine. 335 (12): 900–1, author reply 902. doi:10.1056/NEJM199609193351217. PMID 8778626. Magner J (September 1996). "Smallpox". The New England Journal of Medicine. 335 (12): 900–902. doi:10.1056/NEJM199609193351217. PMID 8778624. Kumate-Rodríguez J (1996). "Bicentennial of smallpox vaccine: experiences and lessons" [Bicentennial of smallpox vaccine: experiences and lessons]. Salud Pública De México (in Spanish). 38 (5): 379–85. PMID 9092091. Budai J (August 1996). "200th anniversary of the Jenner smallpox vaccine" [200th anniversary of the Jenner smallpox vaccine]. Orvosi Hetilap (in Hungarian). 137 (34): 1875–7. PMID 8927342. Rathbone J (June 1996). "Lady Mary Wortley Montague's contribution to the eradication of smallpox". Lancet. 347 (9014): 1566. doi:10.1016/S0140-6736(96)90724-2. PMID 8684145. Baxby D (June 1996). "The Jenner bicentenary; still uses for smallpox vaccine". Epidemiology and Infection. 116 (3): 231–4. doi:10.1017/S0950268800052523. PMC 2271423. PMID 8666065. Cook GC (May 1996). "Dr William Woodville (1752–1805) and the St Pancras Smallpox Hospital". Journal of Medical Biography. 4 (2): 71–8. PMID 11616267. Baxby D (1996). "Jenner and the control of smallpox". Transactions of the Medical Society of London. 113: 18–22. PMID 10326082. Dunn PM (January 1996). "Dr Edward Jenner (1749–1823) of Berkeley, and vaccination against smallpox". Archives of Disease in Childhood. 74 (1): F77–8. doi:10.1136/fn.74.1.F77. PMC 2528332. PMID 8653442. Meynell E (August 1995). "French reactions to Jenner's discovery of smallpox vaccination: the primary sources". Social History of Medicine. 8 (2): 285–303. doi:10.1093/shm/8.2.285. PMID 11639810. Bloch H (July 1993). "Edward Jenner (1749–1823). The history and effects of smallpox, inoculation, and vaccination". American Journal of Diseases of Children. 147 (7): 772–4. doi:10.1001/archpedi.1993.02160310074022. PMID 8322750. Roses DF (October 1992). "From Hunter and the Great Pox to Jenner and smallpox". Surgery, Gynecology & Obstetrics. 175 (4): 365–72. PMID 1411896. Turk JL, Allen E (April 1990). 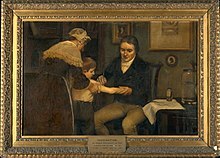 "The influence of John Hunter's inoculation practice on Edward Jenner's discovery of vaccination against smallpox". Journal of the Royal Society of Medicine. 83 (4): 266–7. PMC 1292617. PMID 2187990. Poliakov VE (December 1985). "Edward Jenner and vaccination against smallpox" [Edward Jenner and vaccination against smallpox]. Meditsinskaia Sestra (in Russian). 44 (12): 49–51. PMID 3912642. Hammarsten JF, Tattersall W, Hammarsten JE (1979). "Who discovered smallpox vaccination? Edward Jenner or Benjamin Jesty?". Transactions of the American Clinical and Climatological Association. 90: 44–55. PMC 2279376. PMID 390826. Rodrigues BA (1975). "Smallpox eradication in the Americas". Bulletin of the Pan American Health Organization. 9 (1): 53–68. PMID 167890. Wynder EL (March 1974). "A corner of history: Jenner and his smallpox vaccine". Preventive Medicine. 3 (1): 173–5. doi:10.1016/0091-7435(74)90074-7. PMID 4592685. Andreae H (June 1973). "Edward Jenner, initiator of cowpox vaccination against human smallpox, died 150 years ago" [Edward Jenner, initiator of cowpox vaccination against human smallpox, died 150 years ago]. Das Offentliche Gesundheitswesen (in German). 35 (6): 366–7. PMID 4269783. Friedrich I (February 1973). "A cure for smallpox. On the 150th anniversary of Edward Jenner's death" [A cure for smallpox. On the 150th anniversary of Edward Jenner's death]. Orvosi Hetilap (in Hungarian). 114 (6): 336–8. PMID 4567814. MacNalty AS (January 1968). "The prevention of smallpox: from Edward Jenner to Monckton Copeman". Medical History. 12 (1): 1–18. doi:10.1017/s0025727300012722. PMC 1033768. PMID 4867646. Udovitskaia EF (November 1966). "Edward Jenner and the history of his scientific achievement. (On the 170th anniversary of the discovery of smallpox vaccination)" [Edward Jenner and the history of his scientific achievement. (On the 170th anniversary of the discovery of smallpox vaccination)]. Vrachebnoe Delo (in Russian). 11: 111–5. PMID 4885910. Voigt K (1964). "THE PHARMACY DISPLAY WINDOW. EDWARD JENNER DISCOVERED SMALLPOX VACCINATION" [The Pharmacy Display Window. Edward Jenner Discovered Smallpox Vaccination]. Pharmazeutische Praxis (in German). 106: 88–9. PMID 14237138. Davies JW (1970). "A historical note on the Reverend John Clinch, first Canadian vaccinator". CMAJ. 102: 957–61. Roberts KB (1978). "Smallpox: an historic disease". Memorial University of Newfoundland Occas Papers Med Hist. 1: 31–9. LeFanu WR. 1951 A bio-bibliography of Edward Jenner, 1749–1823. London (UK): Harvey and Blythe; 1951. p. 103–8. "Smallpox Zero". African Comic Production House, Johannesburg, South Africa. ISBN 978-0-620-43765-3. Archived from the original on 19 January 2012.